Fibre Space! | Stitch, Brinn, Stitch! 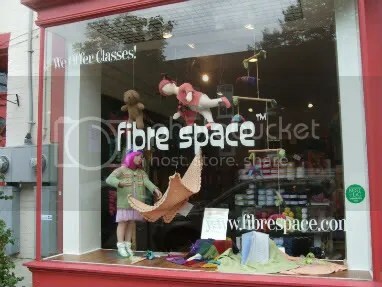 The shop is lovely and bright and full of pretty, pretty yarns. 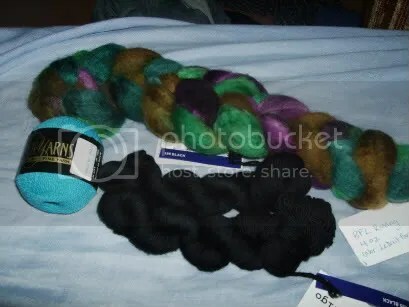 Mostly stuff that’s a bit out of my price range, but I was pleased to be able to fondle things like Malabrigo and Blue Sky Cotton and MadTosh, which I hadn’t previously seen in person (they’re all lovely). The staff was wonderful and my non-knitting boyfriend even managed to strike up a conversation with another woman in the shop about knitting styles (I knit continental and noticed when the woman (who was throwing) was knitting differently than I do). That’s a skein of Cascade Fixation (I love me my Cascade) in a lovely teal, which will become socks, two skeins of Malabrigo lace in black, which will most likely become another Featherweight (provided I have the patience), and a 4 oz. braid of BFL in “Ledroit Park” from Neighborhood Yarn Company, which is based in DC. Pretty pretty. I’m in DC until Thursday (which is earlier than I intended, but the reason for my early return is partially my sister is graduating and partially very long and sordid, so we won’t get into it), and after that, I’ll have some big news about the blog (don’t worry; nothing bad).